WW1 Reenactments Equipment : Great War Tommy WW1 Food Rations Labels : Consolidated Pea Soup label, 1915. WW1 Reproductions and WW1 Reenactors Equipment / Kit - Consolidated Pea Soup label, 1915. 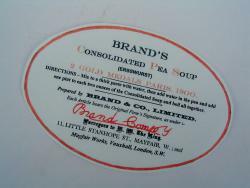 Brand & Co., of London Condensed Pea Soup. Some (possibly 'teetotal') Senior Officers were reluctant to issue the official rum ration to troops in the trenches at 'Stand To'. The unlucky units had this as an alternative!